"Navajo Wars" is a solitaire card driven game which places the player into the role of the Dine (Navajo) from the time of the Spanish incursion in 1595 through the time of their subjugation at the hands of an American Army led by Kit Carson in 1864. The term, “Navajo” comes from a Spanish rendering of a Tewa (one of the Pueblo tribes) word for “planted fields.” The Diné were and are still known for their planting of corn in the high desert of New Mexico and Arizona. 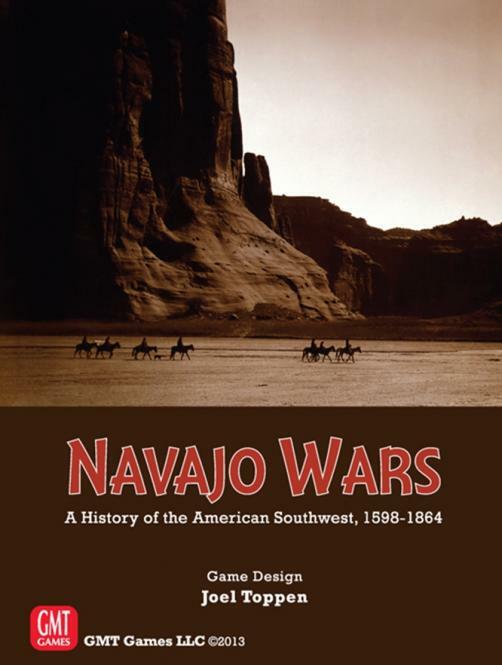 The objective for the Navajo player, hereinafter referred to as "player", is to avoid being subjugated by either the Spanish, Mexicans or the Americans, hereinafter referred to as "enemy". 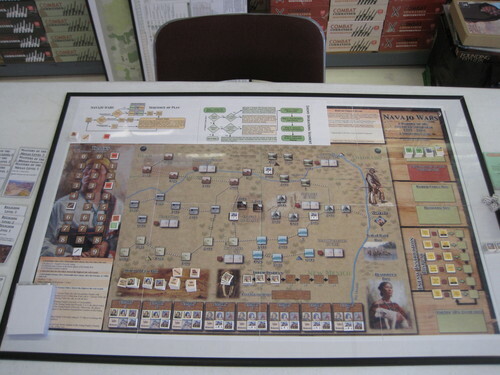 The player will be taking actions during the course of the game to try and increase both culture and military tracks. If both of those reach zero at any time during the game, you will be subjugated by the enemy and immediately lose the game. There are also cultural developments, in the form of a tech tree, that the player will have to develop to increase his chances of winning. The developments are; weaving, horsemanship, religion, masters of the Mesas and sharp trades each having three levels of development. 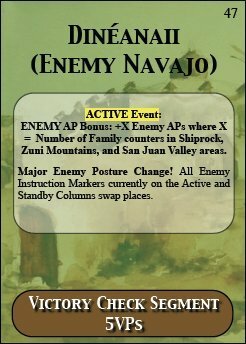 Navajo Wars also has historical event cards for each period. These cards have their own rules and effects that really add a historical feel to the game. As the player, you will be trying to get your family units, "counter" on the map. Your family units could consist of a man, woman and child. With those counters you will be conducting individual actions with your families that are on the map. These actions could include, raids on New Mexico, Raids on an outpost, Tribal warfare & Tribal diplomacy both conducted against the Comanche or the Ute. Create trade goods, husbandry and travel. 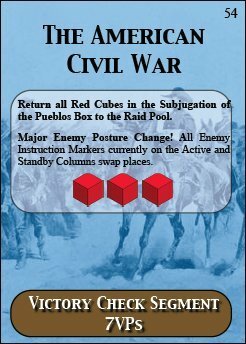 During the enemy portion of the turn, the enemy will be conducting operations against the Navajo tribe. These operations could include: to subvert the natives (player), build outpost, build and subvert, raids (the enemy will try to send raids deep into the Navajo territory) and many other actions. The enemy receives their orders by a unique order matrix. As the player, you are never sure what will be coming next. 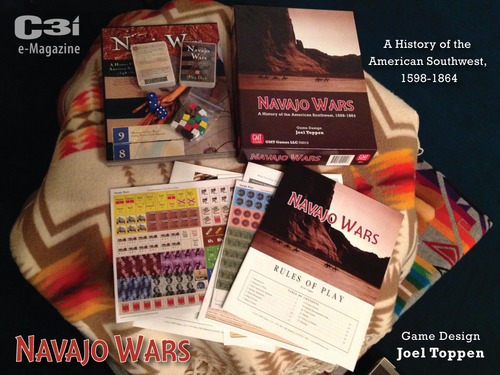 Navajo Wars can be played as individual scenarios for the Spanish, Mexican and American periods. You can play all three periods as a campaign game.